When it comes to determining an antique doll value, accurate identification of the doll is essential. Certain antique dolls such as a Rosie O'Neil kewpie doll or a French bisque Poupee by Jumeau are easier to identify than others. For example, the kewpie may have "O'Neill" clearly marked on the bottom of its feet or the French Poupee may have tick marks and the blue Jumeau stamp on its back. In these instances the dolls are easy to identify making it somewhat simpler to determine their values although many additional factors need to be considered. However, when an antique doll is unmarked, or only has a simple mark such as a number or letter, the first step to determining its value is properly identifying the doll. Searching through doll reference books and price guides is often the best way to identify an antique doll. There are many reference books that provide lists of doll marks to help identify the doll maker. These reference works are very useful if the doll has a mold mark or a simple mark. Theriault's Auction Company specializes in antique and collectible dolls and toys. 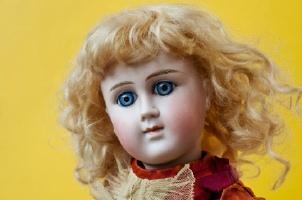 In 2009, the highest price ever paid for an antique doll was sold at a Theriault's auction. The doll made in Paris in 1915 and designed by sculptor Albert Marque closed at $263,000. The National Antique Doll Dealers Association, NADDA, was founded in 1986 as an organization for doll dealers to establish a feeling of confidence and trust with doll collectors and the general public. The organization put together a code of ethics dealers follow. The United Federation of Doll Clubs is an international organization dedicated to doll collecting. Even when all the factors used in determining an antique doll value are considered, the value still fluctuates based on the current doll market and the principles of supply and demand.